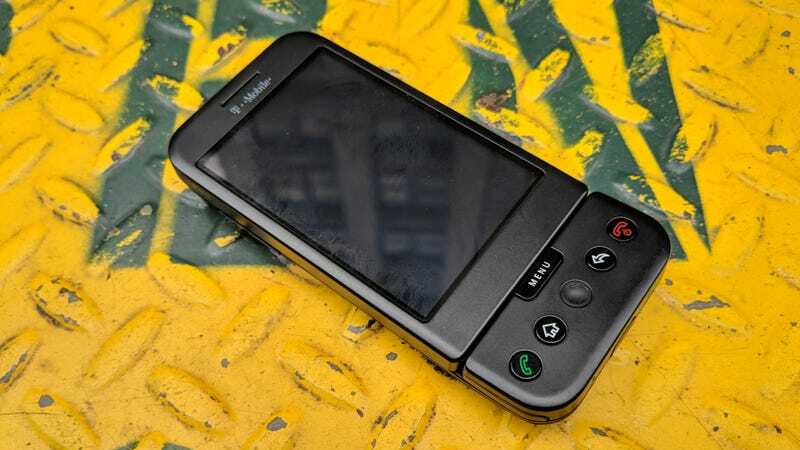 Over the last week or so, bloggers have been posting warm and fuzzy reflections about Android because we’ve just passed the 10th anniversary of the reveal of the T-Mobile G1, (AKA the HTC Dream, or colloquially the “G phone”), the platform’s first commercial device. Many folks—including this here blogger—had basically the same idea: Get your hands on the device (I took mine to T-Mobile for activation and they were all “nah”) take some photos or video, and wax about “back in the day.” Let me tell you something about back in the day: Android sucked. Even at the time, I don’t think anyone was confused about what was going on with Android or the T-Mobile G1. The notion of an open source alternative to the iPhone was appealing, but both the hardware and software were very nearly unusable. The phone was a vehicle for an idea that was barely conceived, let alone fully realized. Though its fun Sidekick-like slideout keyboard was very satisfying, the hardware design amounts to a weird stopover gadget between the BlackBerry and the modern smartphone: Why would you need a trackball if you have a touchscreen? Why no headphone jack? How am supposed to use my right hand to type on the QWERTY keyboard with the phone’s “chin” in the way? But even if you could get past the device’s strange design, the operating system and user interface inside was rudimentary and frustrating. Despite some innovative ideas that would become commonplace—like a pull-down notification window—the device lacked multitouch input, so forget about common gestures like pinch-to-zoom. For being a “Google phone,” the thing incredibly lacked a good number of first-party apps people would have wanted, and the Marketplace was mostly desolate. Peruse some of the older feature walkthrough videos on the Android Developer YouTube channel, and you’ll see just how simple Android was for YEARS after its initial release. Now in a way, it’s not totally fair to make fun of how rough Android was in the beginning. The iPhone and iOS weren’t fully baked when they first shipped either. The first iPhone had no app store! But they did have a certain polish that seemed to represent complete products. And as others have pointed out, the whole point of Android, in the beginning, was not to be the operating system of choice for every human alive. In fact, during its early development, Apple and its iPhone weren’t even in the picture. Google was actually worried that Microsoft and Windows would dominate the mobile device space. So if the T-Mobile G1 isn’t a beautiful device that invites intimacy, that’s because it wasn’t supposed to be. This was a business and productivity gadget. Earlier this year, we passed a more significant milestone than the G1’s 10th anniversary: Five years of good Android phones a rational regular person would choose to buy instead of an iPhone. To my mind, the first viable Android alternatives to the iPhone were the Samsung Galaxy S4 and the HTC One (M7), which were both announced in March 2013. Android Jelly Bean, the platform those devices ran, was the first truly usable iteration of the platform. I took all the photos in this post in a few minutes towards the end of the day on a Google Pixel 2, a phone that is in many ways the inheritor of that old T-Mobile G1's legacy. It was almost too easy to get stuff that looked just as good as with the Olympus mirrorless camera on my desk. Do I need to say it? I CAN’T BELIEVE HOW FAR WE’VE COME IN 10 YEARS!